A new trade trigger has been posted to the website. This entry was posted in Uncategorized on April 29, 2011 by Gary. The new stop has been posted to the website. This entry was posted in Uncategorized on April 28, 2011 by Gary. Today’s FOMC meeting and press conference has the potential to either put in a daily cycle bottom in the dollar index or initiate a waterfall decline into the dollar’s three year cycle low. There is a lot riding on this meeting. Let me explain. Today will be the 26th day of the current dollar cycle. That cycle typically lasts about 20-25 days. So it’s already starting to stretch here. 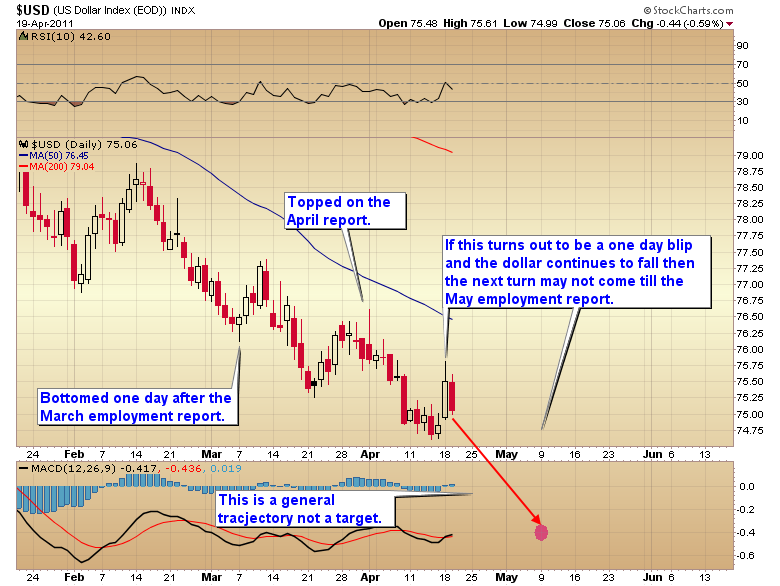 The last few days the dollar has been consolidating while it waits to hear what the Fed has to say. I suspect if the Fed clearly states it will close down QE2 in June that will give the dollar the impetus for another dead cat bounce. Make no mistake though, this will only be a dead cat bounce. Just because Bernanke ends QE2 in June doesn’t cure the problem of the trillions of dollars he’s already printed. The foolish attempt to print prosperity is going to have dire consequences, it is going to cause a dollar crisis. There’s no way Bernanke can avoid that now. The damage has already been done. There’s no way to push the toothpaste back in the tube. 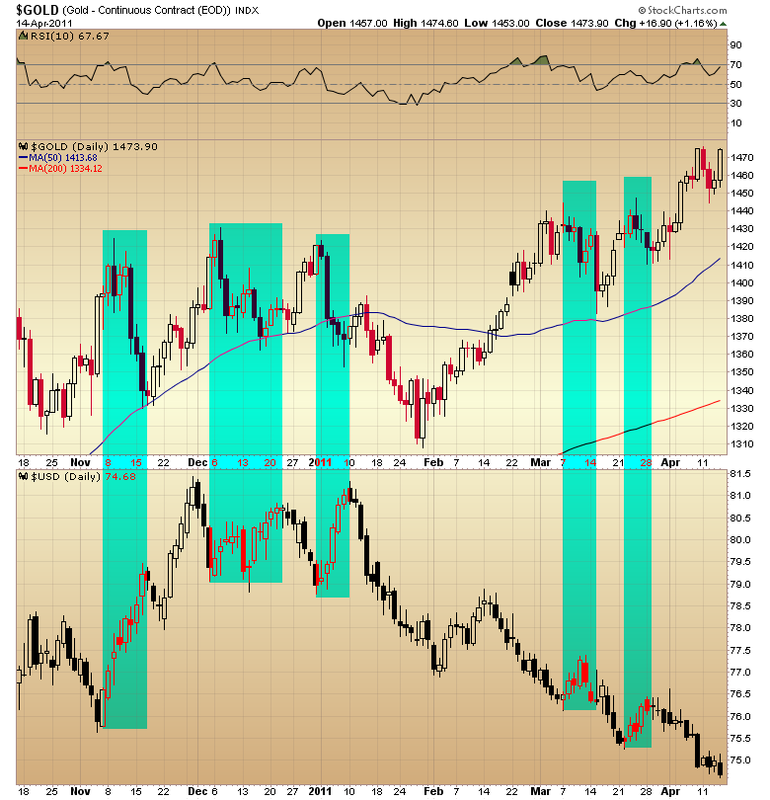 In the event that the Fed does clearly state their intention to end QE (and I think this is the most likely scenario) the minor dollar rally should drive a continuing correction in gold and silver. They are due for a daily cycle correction. It will only be a correction though. 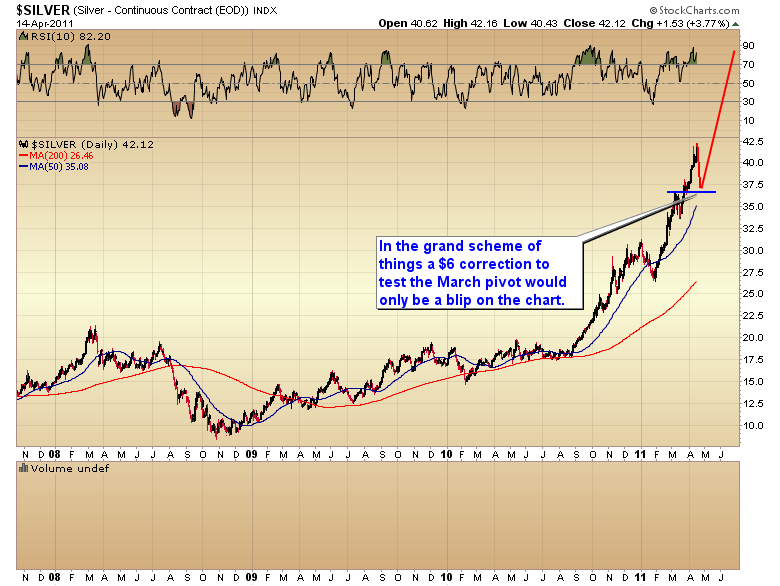 The dollar catastrophe isn’t done yet and Gold’s C-wave still has further to go (alot further). The other scenario, and the one I think is less likely, Bernanke doesn’t state a clear intention to halt QE and the dollar tanks. Thus initiating a final dollar crisis immediately. Only an Keynesian academic would think lasting prosperity can be created, with no unintended consequences, by printing money. But only an imbecile would risk sending the dollar over the cliff that it’s hanging on. Bernanke had better say the right things this afternoon or all hell is going to break loose in the currency markets. This entry was posted in Uncategorized on April 27, 2011 by Gary. A trade trigger has been posted to the website. This entry was posted in Uncategorized on April 23, 2011 by Gary. For many months now I’ve been warning we were going to have a dollar crisis and that dollar crisis would drive the final leg up in gold’s ongoing two year C-wave advance. We are now on the verge of the panic selling stage of this three year cycle. On Monday the dollar briefly rallied on the S&P downgrade of US debt (who knew?). That had the potential to mark the bottom of the current dollar cycle. But by this morning the dollar has given back all of those gains and then some. I’ve noted in the premium report that the dollar’s daily cycle often turns on the employment report at the beginning of each month. 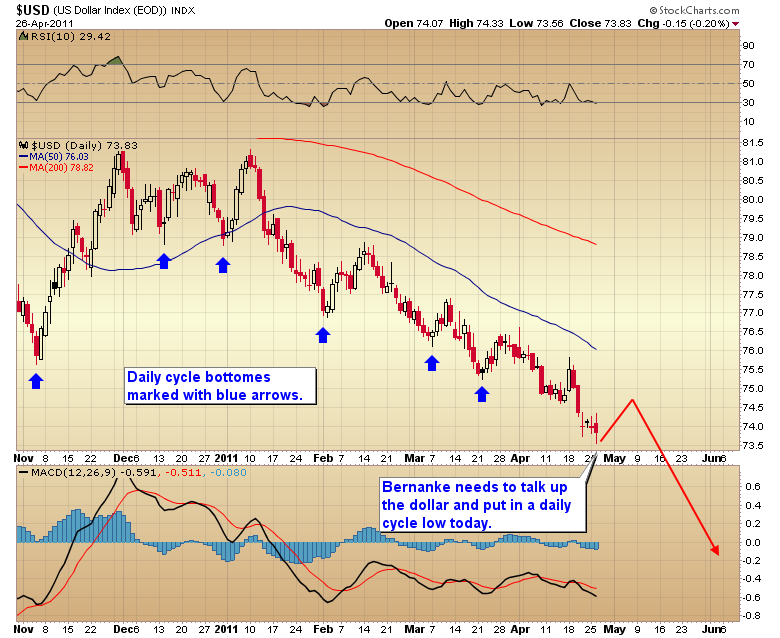 The previous cycle bottomed one day after the March report and the current daily cycle topped on the April report. If this pattern continues then we can probably expect the current dollar cycle to stretch for another 2 1/2 weeks into the May report (give or take a day or two either way). I seriously doubt gold is going to suffer any meaningful correction as long as the dollar is in free fall, so I expect we are going to see the gold cycle stretch also. If the dollar does continue lower into the May employment report before putting in the cycle low it would then be set up for a more normal duration decline into the final three year cycle low due on or around the June report. However with the dollar losing it’s chance to rally here gold and especially silver are now at risk of entering a runaway rally. Details in last nights subscriber report. This entry was posted in Uncategorized on April 20, 2011 by Gary. A possible portfolio change has been posted to the premium website. This entry was posted in Uncategorized on April 18, 2011 by Gary. I’ve unlocked the weekend report. 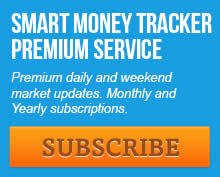 Click here for the premium website. Click on the Apr. 16th link to access the weekend report. This entry was posted in Uncategorized on April 17, 2011 by Gary. I’m starting to get the feeling that many people have now come to the conclusion that silver is bullet proof. First off let me warn you that we still haven’t seen anything that looks like a daily cycle correction yet, and gold is now moving into the latter part of the timing band for that short term correction. When gold dips down into that trough silver is going to follow. Next let me show you a couple of longer term charts so you can get some idea of just how overbought this market is and how dangerous this is becoming especially this late in the cycle. 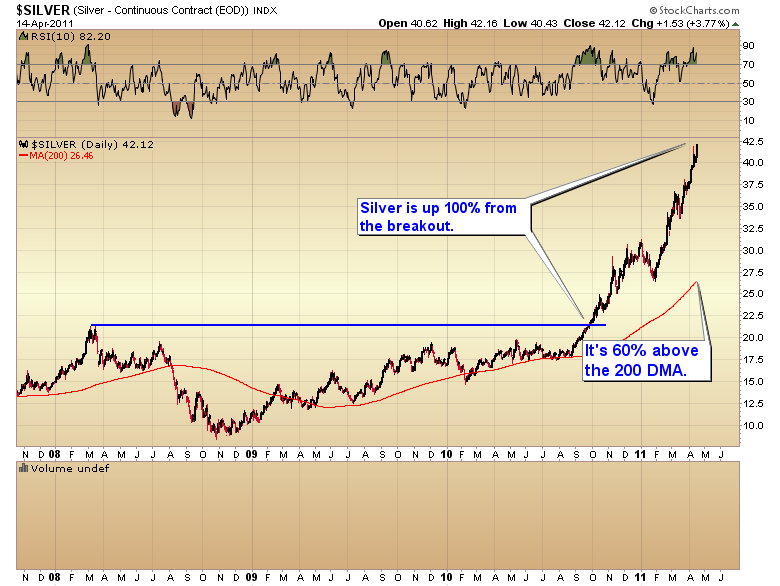 In the first chart I’ve noted that silver has now rallied 100% above the last C-wave peak. That’s much larger than any other C-wave rally. It’s pretty rare to ever see an asset rally 100% above a prior peak. That alone warrants caution. I also noted that silver is currently stretched 60% above the 200 DMA, also a new all time high. I suggested in a nightly report that we could easily see a $3-$6 correction in silver once the move down into the daily cycle trough begins. I have a feeling most people at this point think that’s virtually impossible. But is it really? Look at a $6 correction on that long term chart. A $6 correction is almost insignificant. It wouldn’t even take silver back to the 50 DMA. A $6 correction would just be a normal pullback to test the March pivot and ease the extremely stretched conditions. I’ll tell you what else a $6 correction would do. It would destroy all the over leveraged players. 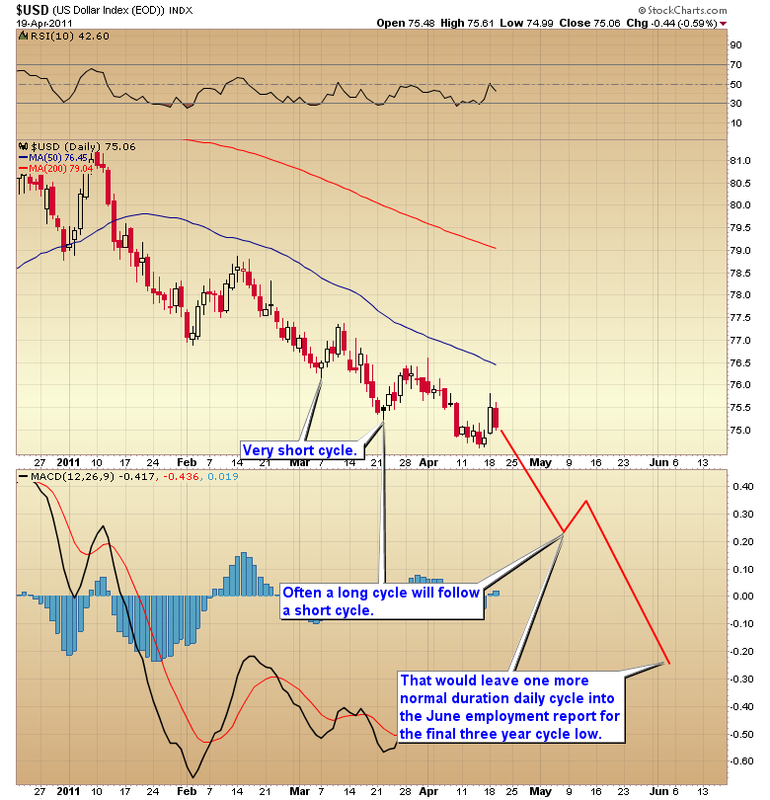 It would convince everyone that the silver rally is finished. And more importantly it would set silver up for the final spike higher to my expected target of $50 during the final daily cycle. Ask yourself, are you so heavily leveraged that a move back to $36-$37 would completely freak you out and knock you out of your positions? If so then maybe you need to focus on these long term charts and ease back on your leverage until gold moves down into it’s cycle bottom. When gold gets this deep into a cycle a move higher by the dollar almost always triggers a corrction. 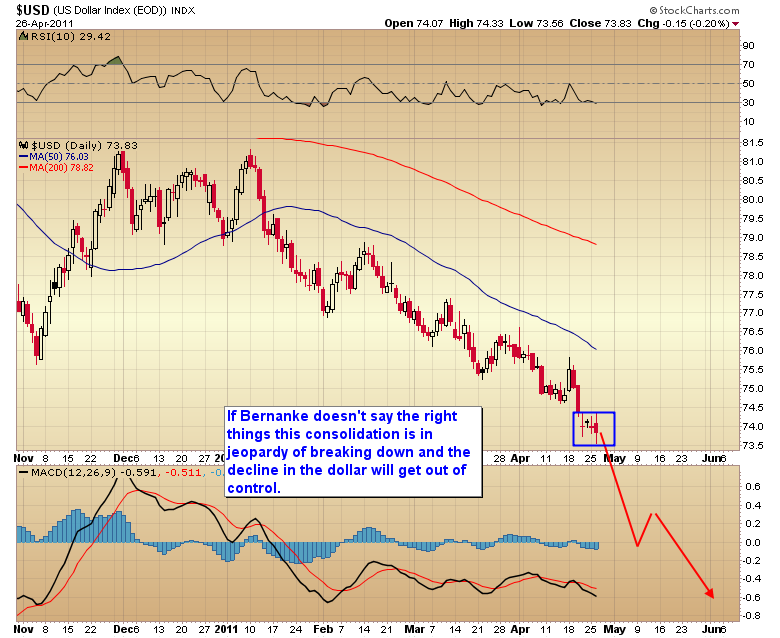 The dollar is due for a short term bottom any time now. I expect this time won’t be any different in that a dollar rally will trigger gold’s move down into the impending cycle low. This late in a daily cycle and this stretched above the mean it is becoming increasingly dangerous to keep your foot to the metal (pun intended). If you’re driving 200 MPH you might want to slow down to 100-120 for the next week or two. This entry was posted in Uncategorized on April 15, 2011 by Gary. A portfolio change has been posted to the premium site. This entry was posted in Uncategorized on April 12, 2011 by Gary. A portfolio change has been posted. This entry was posted in Uncategorized on April 11, 2011 by Gary.